These machines are installed in my sewing room and are being used all the time. Each machine has its own unique set of functions which are needed in different situations, so although “all the time” does not mean 24/7, it still means that these machines are needed regularly and should be ready, willing and available all the time. My sewing crew is evolving, I am on a quest of perfection. See the previous edition, or the next edition. My machines are all vintage. See why that is. Some of the machines have their own pages. Just click on the name to see them. You will notice that many of my machines are placed in simple plastic cases instead of nice period wooden ones. This is because these cases have a surrounding edge so they can be lowered into a cut-out in a table, see photo below. This allows me to swap out flat bed machines quickly and easily – just unplug and lift out. I also fit them with the same type of motor so they could all use the same plug! ​Butterfly and Dragonfly – straight stitch, zig-zag and fancy stitches: 1950s German Haid & Neu Primatic (a.k.a. Harris Automatic), vertical oscillating hook, class 15 bobbins, high shank feet. This is my main machine. It can disengage the zig-zag, so the straight stitch is really straight. It sews all sorts of fabrics beautifully, from fine to thick and heavy. It manages to sew with double needle without pulling together the stitches. However, it is a lockstitch machine, so I don’t use it for jersey. I got Harris first, but it had no cams, so when I came across its green sister on German eBay, I had to have it too. This is how I ended up with two identical machines with just one cam set between them. My little tank – free arm straight stitch, zig-zag and fancy stitches: 1960s Czech Lada T132 (a.k.a. 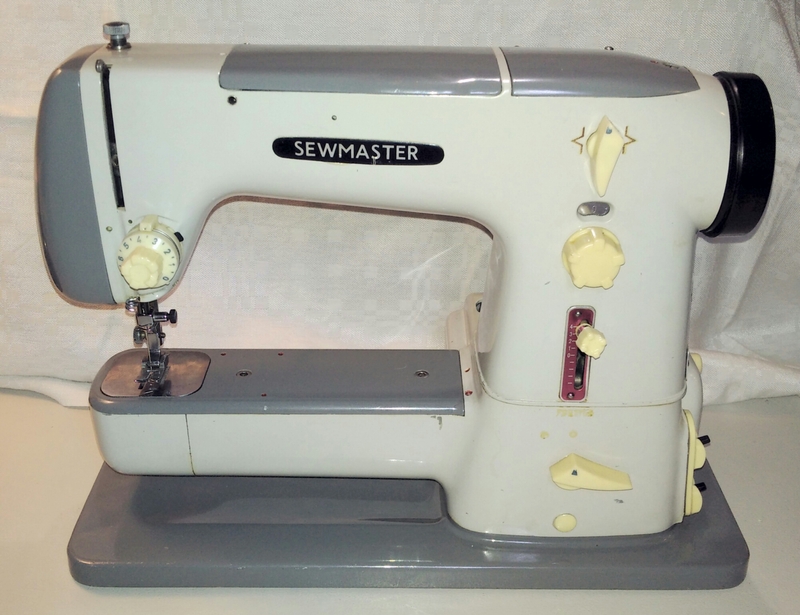 Sewmaster), vertical rotary hook, rotary bobbins, low shank feet. This is my main free arm machine. Like Primatic, it too can disengage the zig-zag, so it has true straight stitch and a large selection of fancy stitches. 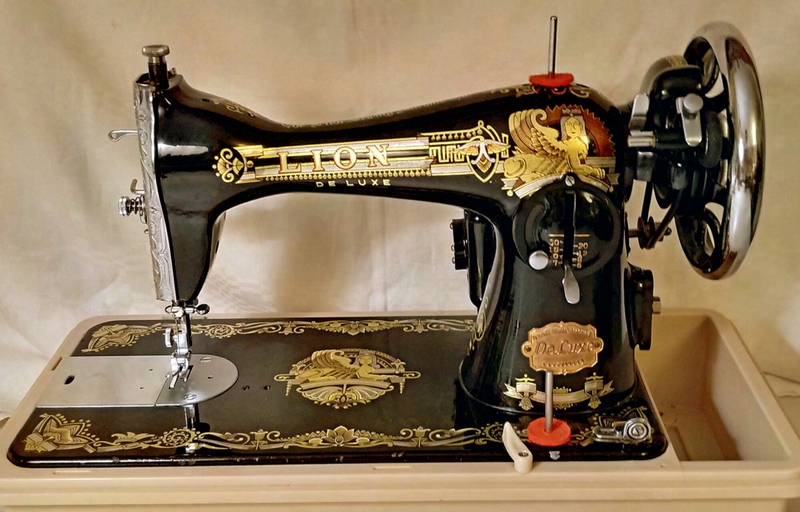 Leya – straight stitch machine: 1950s Lion Deluxe, vertical oscillating hook, class 15 bobbins, low shank feet. A post-WWII Japanese machine based on Singer 15, but smoother, quieter, with reverse and dropped feed dogs. Very versatile, works with all sorts of thread and fabric. 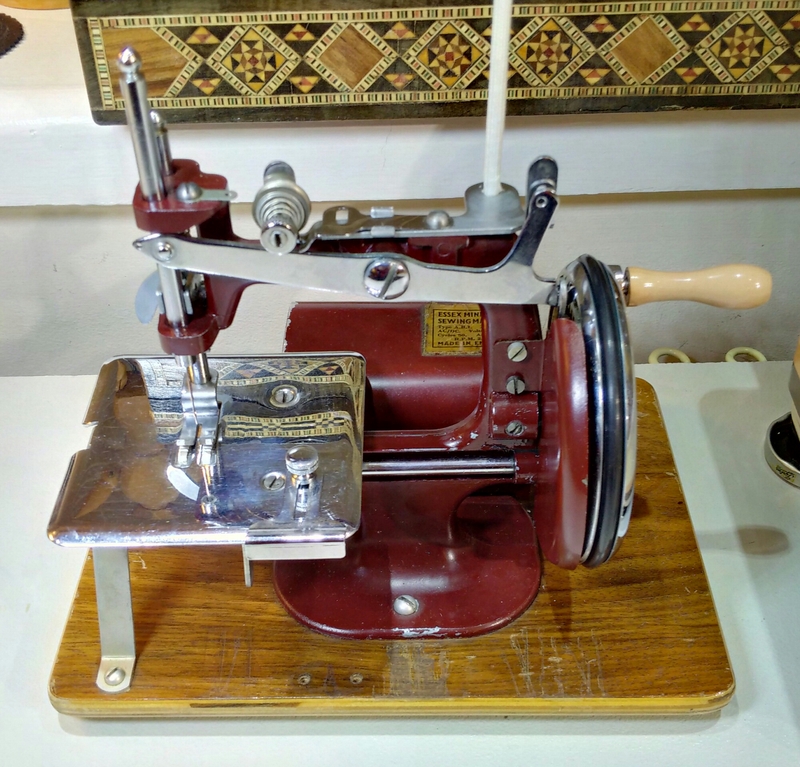 Greta – low tension straight stitch machine, vibrating shuttle, class 27 long bobbins, low shank feet: 1905 German Stoewer VS3, like Singer 28 but with reverse. For difficult fabrics and jersey, lurex thread and free hand embroidery. Exceptionally quiet and delicate. Greta can sew all sorts of fabric, including fluffy wool, loose knits, slippery PVC, denim and leather. It is my ultimate weapon against uncooperative materials. 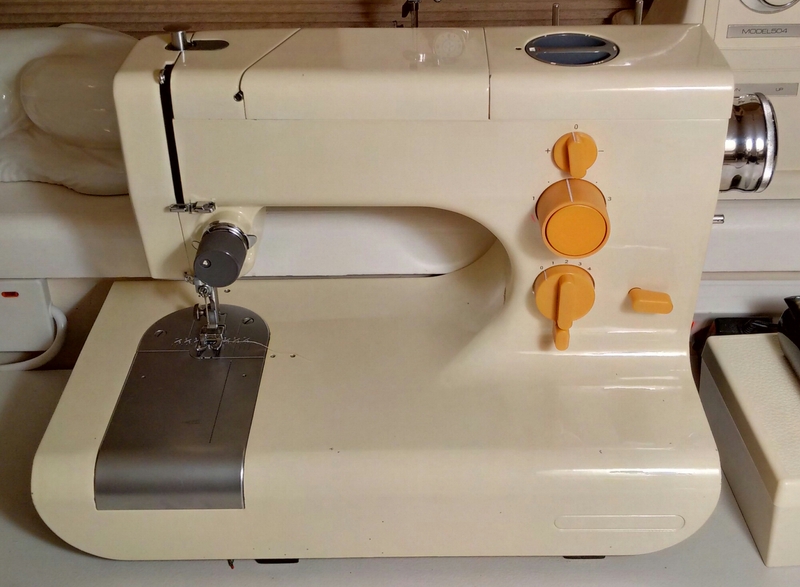 Alice – auxillary straight stitch machine: 1963 Scottish Singer 98K, horizontal oscillating hook, class 66 bobbins, low shank feet. Does a good stitch on various fabrics. Compact and self-contained. Great as an extra little machine for projects that use different thread colours, feet or complicated attachments. Alice cannot sew with thick thread like top stitch thread because the hole in the needle plate is too small for that, it is meant for regular or thin thread. 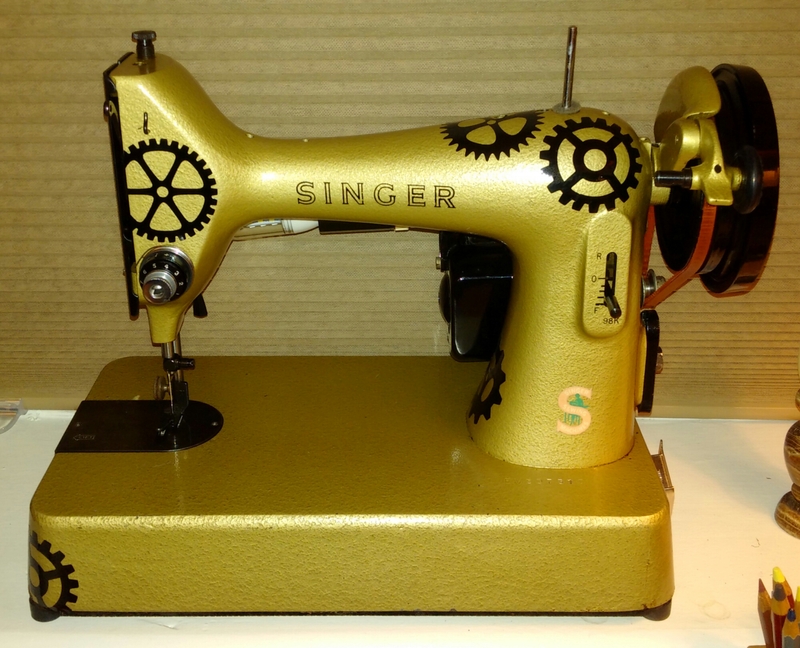 Singer 98K is a bit of a rarity, and needle plates are not readily available. Still, a solution could be found – I simply need another needle plate with a bigger hole. 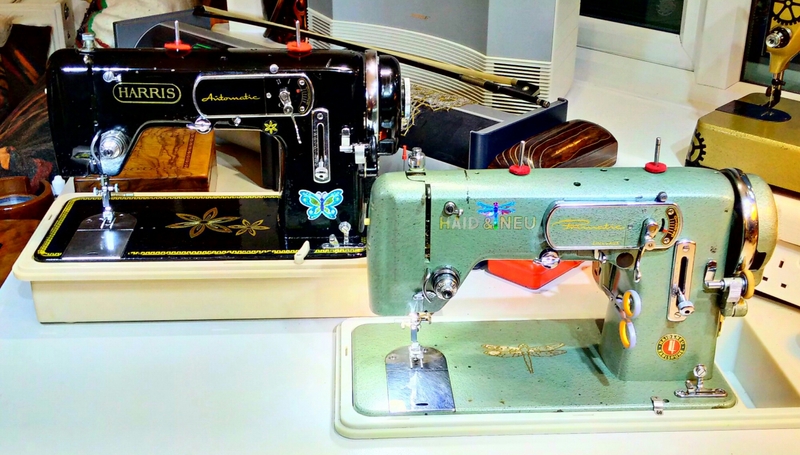 Freya – zig-zag, stretch, chain and fancy stitch machine: 1972 Japanese Frister+Rossmann 804, vertical oscillating hook, class 15 bobbins, low shank feet (converted from super high shank). For all blind hems and fancy stitching, buttonholes, stretch, jersey and knitwear. It does straight stitch too, but like most zig-zag machines, it does not manage to keep it quite straight. 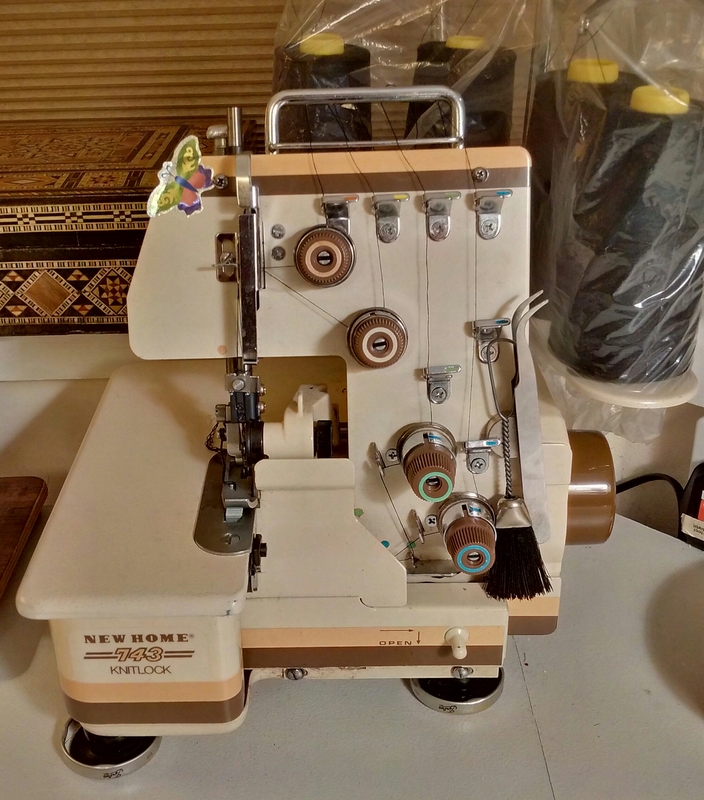 Frida – free arm zig-zag, stretch and fancy stitch machine: 1972 Japanese Frister+Rossmann 504, vertical oscillating hook, class 15 bobbins, low shank feet, a free arm version of the above, so using the same emroidery cams. Should be able to chain stitch as well, but I need to adapt the needle plate. ​Overlocker: 1970s Japanese New Home 743 Knitlock. It just works, a perfect finish every time, without any knob twiddling. 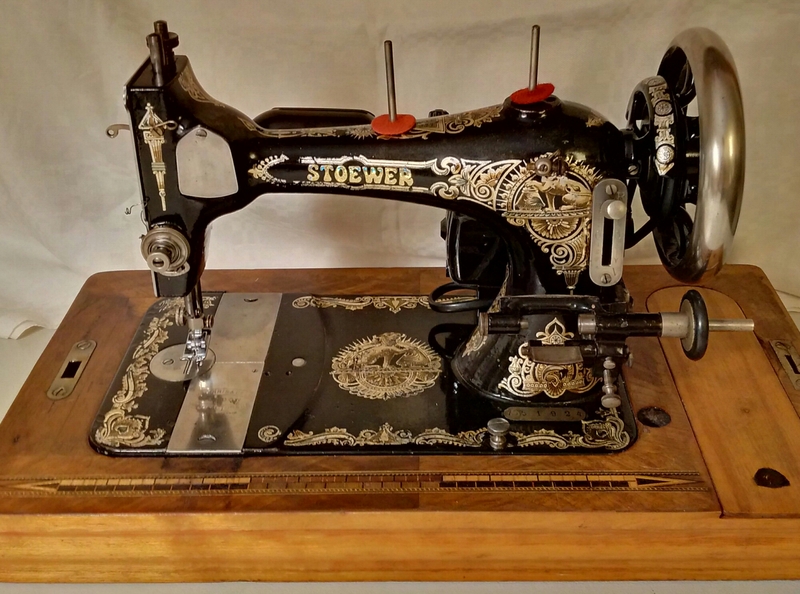 Mathilde – chain stitch machine: 1950 English Essex Mk1, motorised. For light and medium fabrics, a flexible stitch for jersey and a pretty looped stitch for decoration. 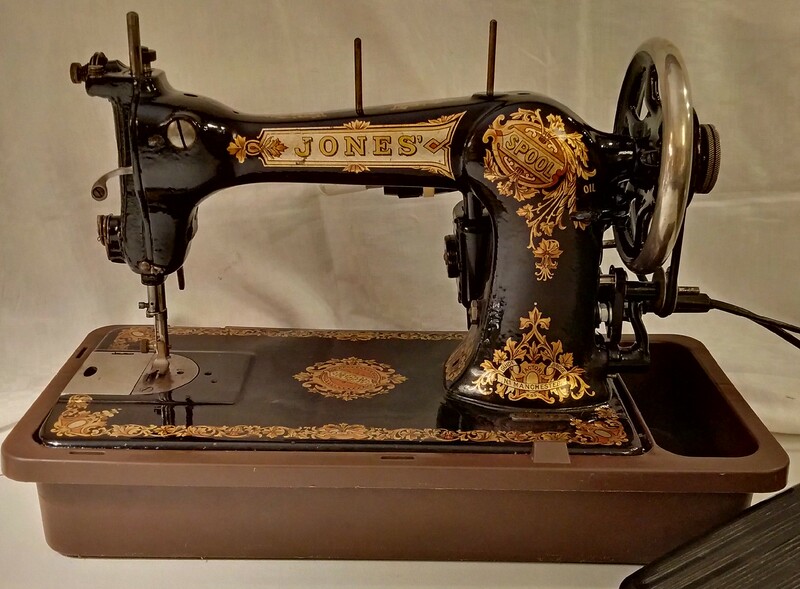 Jenny – long arm straight stitch machine: 1901 English Jones Spool, vertical rotary hook, proprietary bobbins, Jones needles, low shank feet. Does an excellent stitch on a variety of fabrics and with all sorts of thread thanks to its elaborate tension system. However, proprietary bobbins are a bit of a challenge – I just have a single one! These machines I sold because I found something more suitable, and as the space is limited, I had to sell some. It is very sad, but such is life. 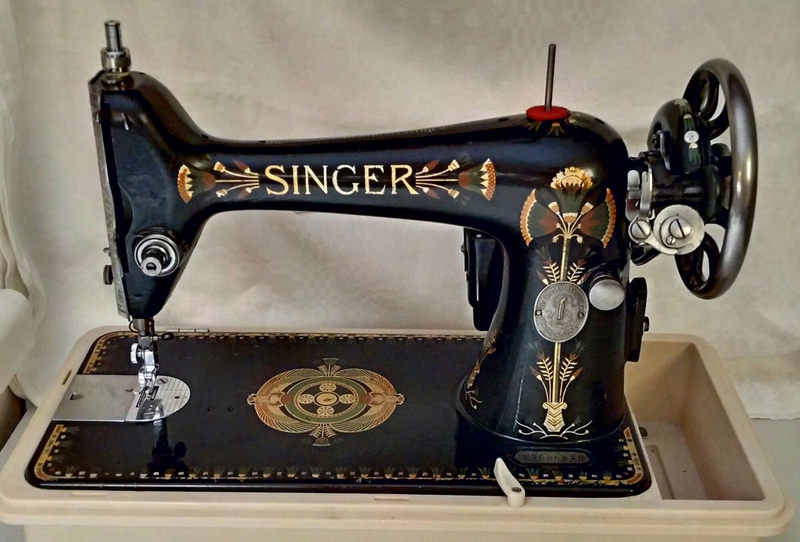 Long arm straight stitch machine, for large projects: 1917 Scottish Singer 66K. Heavy duty and excellent with thicker thread and fabric. Does a fantastic decorative stitch with top stitch thread. Wow I enjoyed looking at your evolving sewing crew! Some seriously beautiful machines!